This was a toy that my cats loved to play with when they were younger and much smaller. It had been on the sun porch aka 'kitty quarters' un played with for a year. I removed it from the kitty quarters and I set it on the living room rug near the door, to remind me to give it to my neighbor's cat. My neighbor had adopted the petite, now one year old, black, sweet, stray that had come into my yard in March. I had taken the, what appeared to be a 4-5 month old, kitten to the vet to see if it had a 'chip' so that I could see if I could find her owner. Even the vet thought that she was only 4-5 months old- based on size. Imagine, our surprise to find out that her teeth said that she was 8 months old at the time and pregnant. I paid for her spay and vaccines so that I could have a better chance of finding her a new home. Other methods to find her owner had not worked out. I'm happy to say that my neighbor adopted her and she has proven me to be right- that she is indeed a sweet, smart kitty. Well, as soon as I put, the unused toy, in the living room, in a different place, from where it had been ignored for over a year… both of my cats came over to play on with it. However, Henry got nostalgic and he also seemed so sad, when he sat on it like he used to do and he realized that he was NOW TOO BIG to make the ball go around ‘WHILE’ sitting on it like he used to when he was smaller. 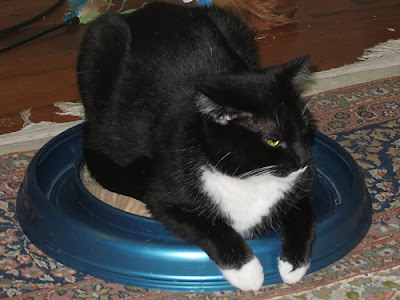 I guess that cats can sometimes be just like children, when you get their old toys out, to give them away, suddenly they want to play with the outgrown toys again. I found this car in a restaurant parking lot, when I lived in Northern Italy. I have never seen tire treads like this before. any body damage to the car? Or maybe, it was rarely driven? I bought this desk/chair set right before I moved from Seoul to Germany in 2008. When you push the chair in... it just looks like a small table. I also like the little drawers on the back-- the 3 small bottom ones which are under the seat when you are sitting down. They are very long drawers too. Clever use of space. I bought some furniture when I was in Korea- but, I bought things that can go along with other furniture from other locations where I had lived too. This is actually an old hand painted buffet that I bought in Korea. Sometimes, it has been in a living room, but most of the time it is my bedroom dresser. The top 4 drawers, of this buffet, holds socks, underwear, scarves, and the bottom doors hold folded sweaters/etc. There is a shelf in the middle to help the folded items stay folded better- instead of one big pile of folded things that falls over as soon as you remove one item. I gave that tv away to someone when I finally moved. But, it came in handy for watching DVDs and VHS tapes of American TV shows. I would often tape American TV shows on VHS tapes in the summer and play them while I was overseas. Almost all the time, I did not have access to any English speaking tv shows while I was overseas. So, I purchased a lot of DVDS of old American TV shows and movies. I have donated many to the base libraries when I would move to a new location. Spring time. Fresh flowers from the flower market found across the Han River. And, some Celedon vases. The living room in this apartment was small. However, I loved the floor to ceiling windows and the view of the Han River. The blue couch and chair are military issued loaner furniture. The antique trunk, used as a coffee table here (a little too tall for that use though) is now on the sun porch with a huge dog bed on it-- which my 2 cats use for snoozing. The wicker couch, was purchased in the Philippines and it has a wrought iron base. This is also now on the sun porch... aka, kitty quarters. You can also some one of the orchids that I also bought at the flower market. I always had a variety of blooming orchids there, they were so inexpensive there, and so many choices to select from. The abundance of light was really good for them. The antique wardrobe, with the mirror on it-- was bought at my first location: The Philippines. I still have it and it is now in the office. See the glass area behind the blue chair? That is an enclosed balcony area off the living room. They were about 10 feet deep and the width of the room. Each bedroom had one of these and there was another one off the kitchen that I used as a laundry room. A view down the hallway, (an earlier post shows this area, empty, before I moved in) and the hallway was so wide that you could place furniture along the walls without affecting the flow of traffic or making the hallway seem too narrow. The desk was hand made in the Philippines, and it is now in my bedroom. *Most of the time, it spent its life in storage. The doorway that you see leads to the master bedroom. Another antique wardrobe (a free standing closet) from the Philippines. The floors in this apartment were out of bamboo and the entire apartment had heated floors. Since, I was on the 7th floor, I didn't even have to turn the heat on, until it got really cold, because the heat from the other apartments, below my apartment, made it warm enough. Various odds and ends of things. The art work in this photo and the one above it are of Gaeta, Italy. I love this little desk, it has cubby holes and little doors that open to stash cards, postcards, etc. A flowering tree on base. I always called these TULIP TREES. Well, because, they looked like giant tulip flowers. 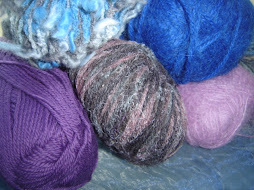 Some silk fabrics that I bought in the fabric building in Seoul. This building was 5 stories tall and consisted of 2 connecting buildings. The inside was so large that you COULD NOT see the walls. So much to see. So much to buy. I loved this place. I also purchased nice wool fabrics and had coats made for me by a tailor. These things were very reasonably priced there. A better cost to get a great coat custom made... than, a purchased coat in America. So, once you lived in Korea... you usually got a coat made and certainly at least left with a leather coat. These photos were taken with my 35mm camera, while I was standing on my front porch, in the tiny town/village that I lived in Italy. It lasted quite awhile and I think that you can at least 'see' that something is happening? The shape of the moon does change and you can see a shadow along the sides. *You can click on the photos for a larger image too and that will help greatly..
With the upcoming Solar Eclipse event that will be happening on August 21 in America, it reminded me of the time that I saw a solar eclipse when I was living in Italy the first time that I lived there in 1997-2000. I quickly started making us each a 'pin' camera, using my knitting needles that I almost always have with me, so that we could watch the eclipse safely on a piece of paper... then, I noticed a water puddle on the ground. So, I told my friend to turn away from the sun, and we watched the entire eclipse in a water puddle. It was amazing to see it that way. It did get twilight, the street lights came on, and the temperatures dropped. It was also pretty cool to be able to watch a solar eclipse while in Venice, Italy too. One of my favorite things about Italy were all the markets that would be held at least once a week in even the smallest of towns. Cities, of course, would have several neighborhood market days during the week. This tradition started hundreds of years ago and you'll still see mention of it or illustrations in old story books and in art work from the past. It was a way to bring other items for sale to the smaller towns and also for the farmers and other handicrafters to be able to sell what they had made. For me? It was a way to get the very freshest fruits and vegetables to eat. This particular market was on the road between where I lived and the US Army Post where I worked. It was only about a mile from my rental house. This particular day was a rainy day. There will be several people selling fruits and vegetables and often they do not have the same thing-- and sometimes the crowd will be very thick in front of a particular seller's space and that always made me stop and look to see what "I" might also need to notice that they were selling. You can also buy fresh flowers at a very reasonable price. I would often do this in the spring time and buy some tulips. fish dishes. I often bought food from him. was taken during the spring and towards the end of the blood orange season. The prices are for PER KILO and are in EURO. green and the flavor is so delicate and wonderful. advertising their special WHITE ASPARAGUS spring dishes. One of my favorite foods is the fresh asparagus risotto. So good. from both of them and put them in the hanging balcony rail flower pots. Guess what is in this bucket? Already 'soaked' beans so that you can start cooking them immediately! When, I lived/work in/at Gaeta, Italy, I often signed up for the MWR (morale, welfare, and recreation) trips on the tiny Navy Base. However, they would also be cancelled because there wasn't enough participation. I found out later that some of this was 'because' the military spouses had their own group and would sponsor their own trips-- which simply meant that there often wasn't enough people to support the base hiring a bus/diver to do the weekend trips. After signing up for a few trips and then find them cancelled, I finally went to the local travel place on base and I asked them if there were any areas that I could go to by train. So, she got me train tickets to go to Postofino, Italy. 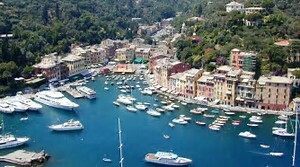 I had to take the city bus to the next town to catch a train and off I went, on an adventure, to Portofino, for the next Saturday. It was only about an hour or so away and often there would be views of the ocean out the train windows. When I arrived, I discovered that the train station was above the town. I disembarked the train and I followed the few passengers that also got off the train. The views were breathtaking... an Italian harbor town laid out in it's own private cove, different levels of the town as it flowed down to the beach and the ocean. You could see the sandy beaches, laughing children, ocean waves splashing against the rocks along the edge of the harbor, and there were many sailboats and a few yachts were docked. *I found out later that this is a 'very' expensive, popular place with the rich and famous too. This is the harbor from the water and all my time was spent 'above all' of this area. 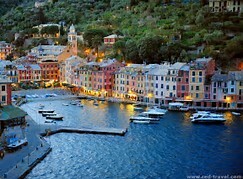 I went back to Portofino another time and I arrived by Ferry to the harbor. I spent the day there and I only stayed in this area. We walked down steep, narrow steps from the train station area and eventually ended up in a level area, full of places to eat, gelato stores, and amazing hand painted ceramic shops. It was very difficult to decide what to purchase. Some of that was because there was JUST SO MUCH to choose from and every shop had their own different artist and styles of painting. The other factor in purchasing items was... I was going to have to carry it all back up those narrow steps, onto the train, and back home. I bought this blue serving platter. This was in a gelato shop... this is the front panel of where all the gelato flavors are displayed. There were a few shops that sold the hand painted tiles that were to be put together like this. I bought one with the intention of using it 'somehow' when I finally moved back to the states. I did use it and I had it placed in my guest bathroom, when I had the shower retiled and updated. Lots of lemons were on the hand painted ceramics... this is an area that grows and produces a lot of lemons. I enjoyed my visit so much - especially with the unexpected find of all the shops with hand painted Italian ceramics, that I went back another Saturday with a friend before we both moved to new locations in a few weeks. During the 27 years that I was living/working overseas I never had a pet. Once I moved back to the states, I decided that I would get a cat. Little did I know that this event would happen sooner than I had expected. I was staying with my good college friend, in Durant, OK, while I was waiting for the closing on my house. A stray cat lived in her yard and she had 2 wild grey kittens that had been born a few months prior to my arrival. One was mostly grey and the other one was grey with more white along her face and she had a 'white blaze' along her back that actually looked like the letter J. The mostly grey one was SUPER WILD. When you opened the back door, for any reason, she would RUN out of the yard and not return for over an hour. Meanwhile, she was missing the food, that was being put outside for the 'yard feral cats'... because, it would be all gone when 'grey, grey' finally returned to the yard. Blaze, tended to run when the door was opened, but, she would return and hang around with her mama cat. My friend and I were able to trap, 'grey, grey' in a live trap. I tried, but she was not at all interested in becoming tamed. We took her to a vet and got her spayed so that she would have a better life. I kept working on taming Blaze, and while she would eat meat from my fingers- it was a month before she would let me touch her. She is a sweet cat... a little shy. And, most certainly does not like her photo taken. Most of the time, she looks down, looks away or gets a weird look on her face. I totally identify with the cat about the photo taking situation. "What, are you doing with that camera again?" This is the way that almost every photo of her looks. They both had so much fun with the packing materials from my move. I left a corner of the dining room full of packing paper for them for a few weeks. Hours of fun was experienced by both cats there. You can see 'Henry' hiding in the distance. She is snuggling with her best buddy Henry. Of course, Henry looks like he is 'begging' for mercy... or has just figured out the murder plot and fears for his life. Actually, he heard the camera click and woke up. They are not siblings but, we suspect that their mothers were siblings. She's actually holding onto Henry's paw while she is sleeping. Sweet. She loves, LOVES to be outside. She kills snakes too and has also killed 2 squirrels. "Why won't she stop taking my photo??"